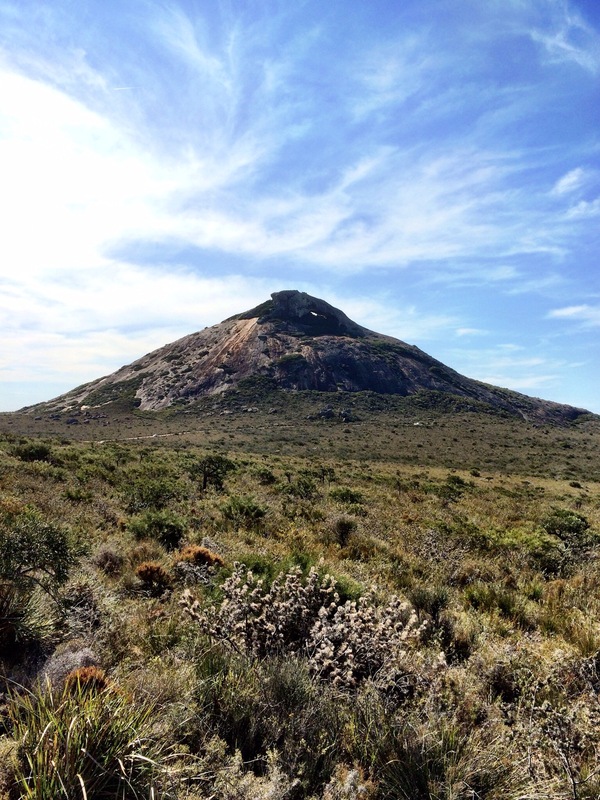 Today we drive down the road (500km down the road) to Cape Le Grand National Park. On the way there we stop to have lunch in a park in Ravensthorpe. 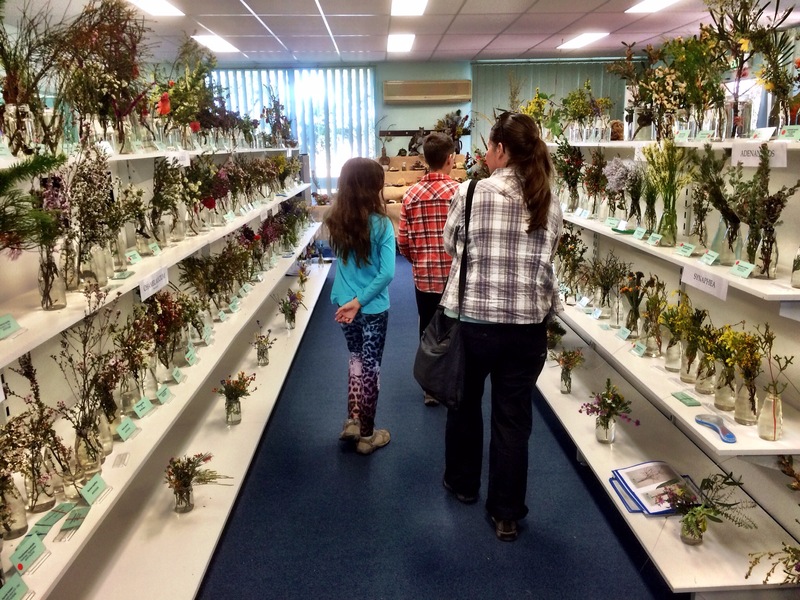 A woman comes along for a chat – wants to show the kids her Pygmy possum, and she speaks so passionately about the town’s wildflower show that had just opened and how the community gets behind it. With that salesmanship how can we resist. So we pay the entry fee and have a look. The family like that one of the plants here is called ‘Old Man’s Beard’. I don’t know what’s funny about that. 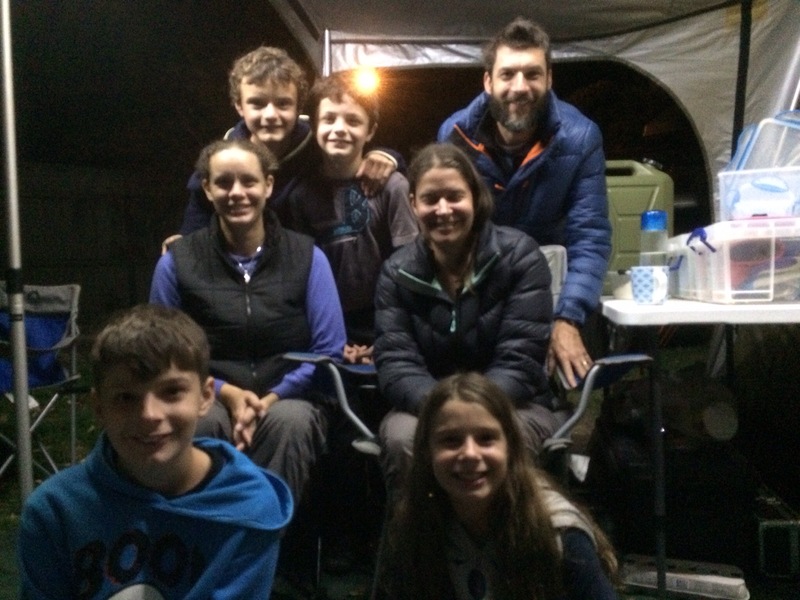 We get to Cape Le Grand and set up camp for the night. As usual the tenting campground is mostly empty. Everyone is in the caravan, camper-trailer section. This is us in the morning. Although it not the normal serene national park. they are doing a major upgrade of facilities – so at 6.30am the generators come on and the tractors start their engines. First on the agenda for the morning is to climb Frenchmen’s Peak. 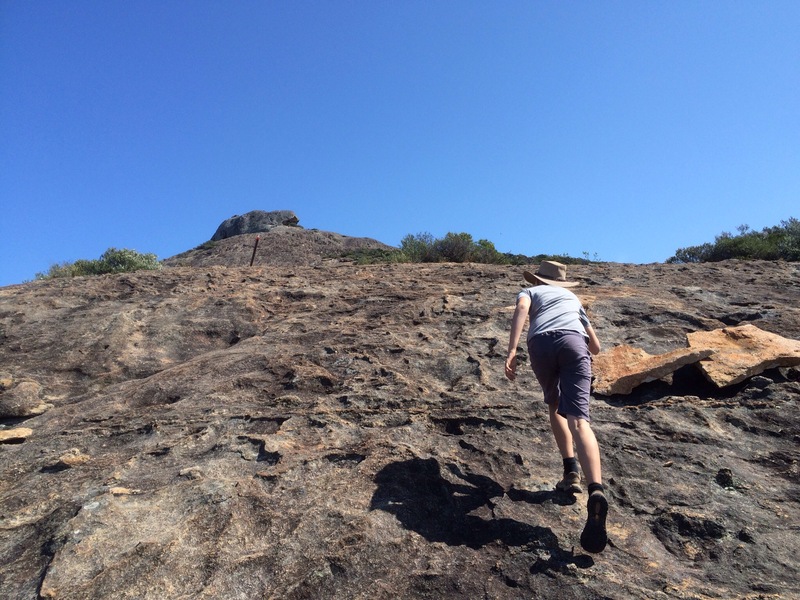 It’s a steep walk up the side of the granite hill and there’s a couple of caves to explore which is fun. 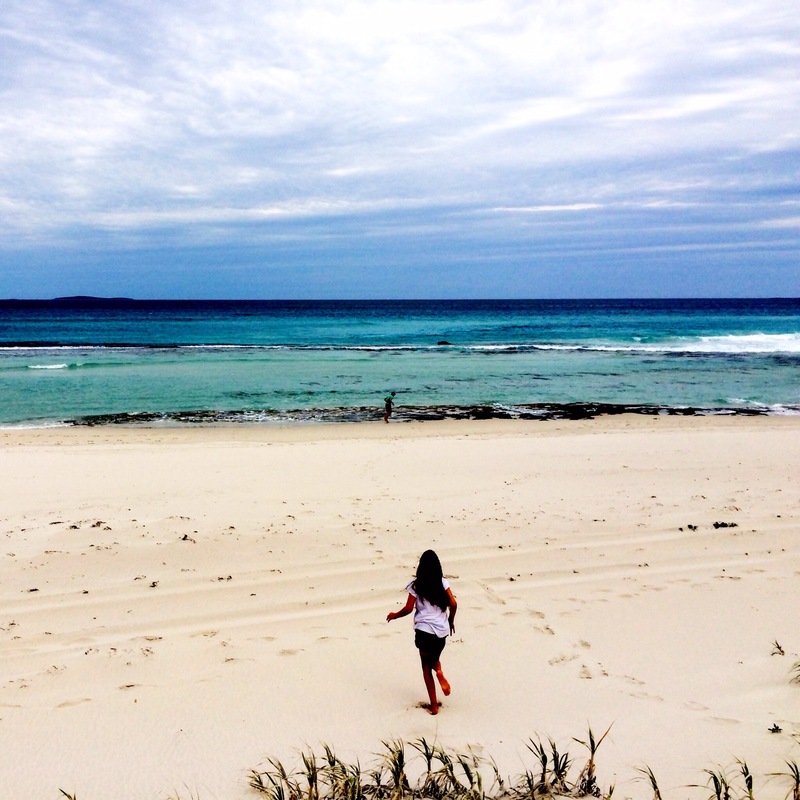 Cape Le a Grand has the most stunning white beaches. Hellfire Beach is our favourite. The beach where we are staying is calked Lucky Bay. It would also be stunning white if it wasn’t covered in seaweed. It makes for good cushioning for the Kangaroos. In the afternoon the kids and I go fishing. I catch 3 fish. Each fish is different. Each fish I have no idea what it is. Each fish is probably undersized and I don’t even know if they are good eating. So once again I do my bit to protect the local fishing stocks and once again Kirsty has to cook dinner from our supplies. But man it was such a nice time. 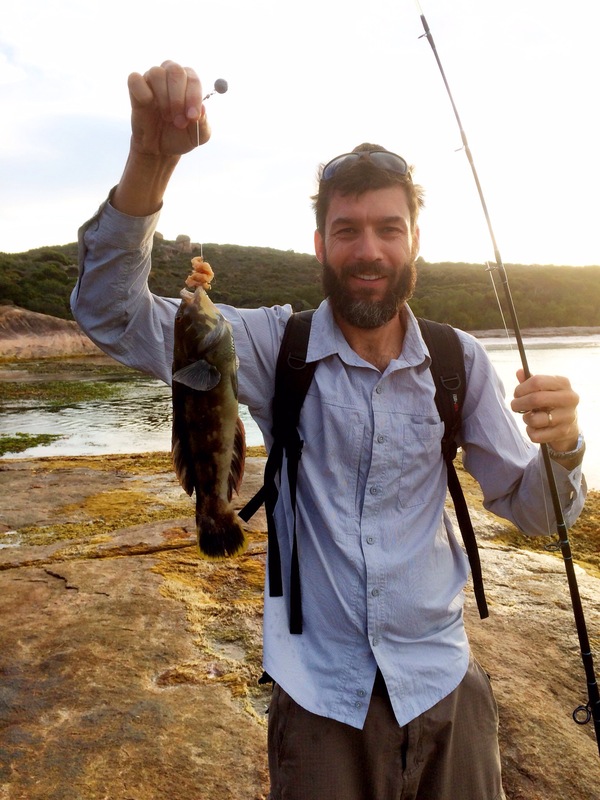 Fishing in crystal clear water and exploring amongst the rocks and caves. We’ve also made a new PB for the time period between showers – 5 days. Thank you. Thank you. If the Dutch were the first white people to set foot on the WA west coast, it was the French who first to set foot on the WA south coast. 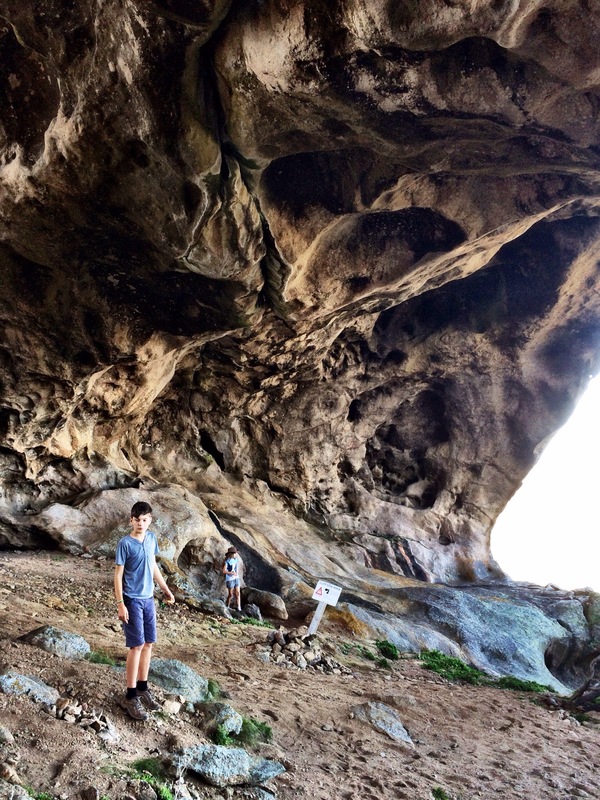 Many places around here are named after French explorers, French ships etc – eg. 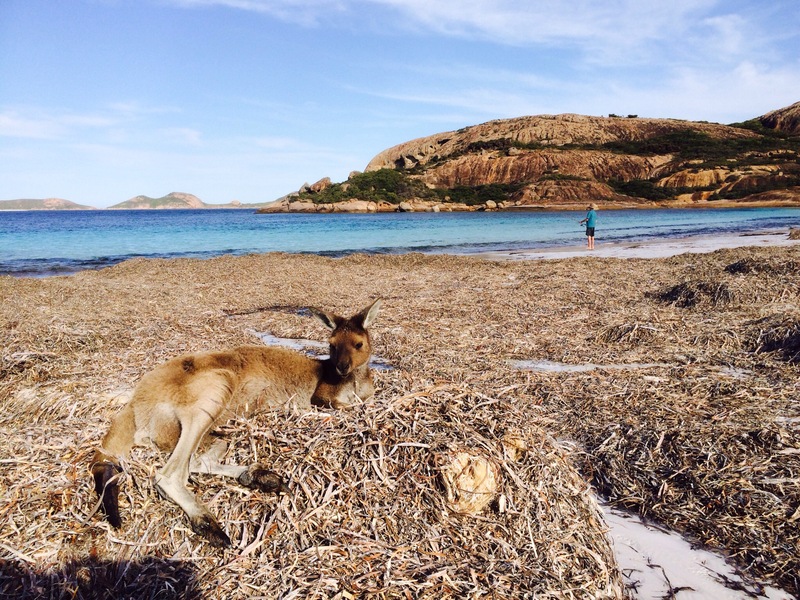 Cape Le Grand, Esperance, D’Entrecasteaux National Park. 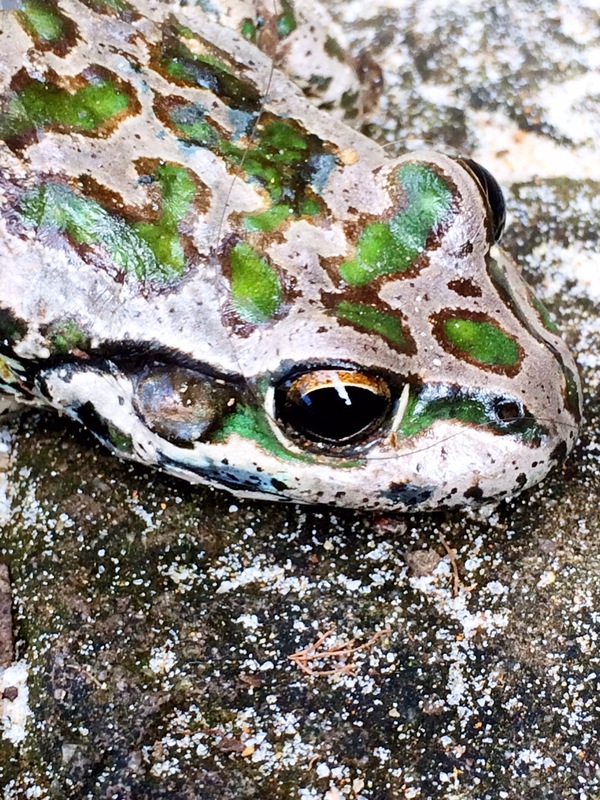 Speaking of the French, here’s a frog. 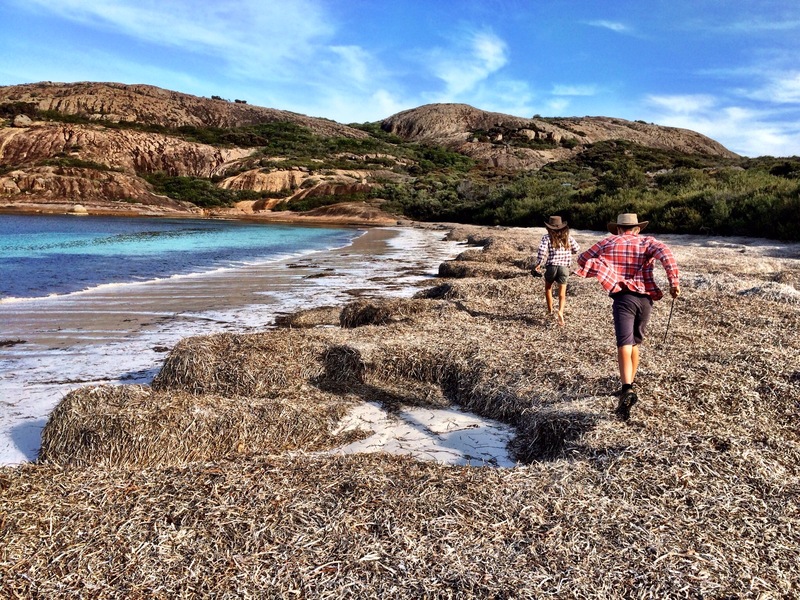 After a couple of days at Cape Le Grand we head into the town of Esperance and check out some of the local beaches. This is the kids running down to the beach to get a closer look at some Southern Right Whales that aren’t far off the beach. And to our surprise we hear them make their sounds, a bit like an elephant trumpeting. 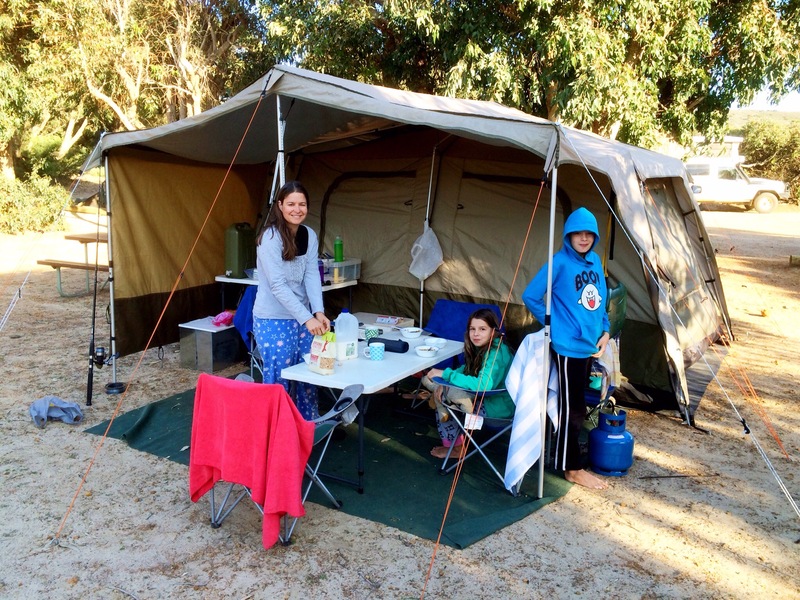 We stay one night at a caravan park in Esperance. And we get our last chance to hang out with Julie, Max and Oscar. It would be great to have them visit us in Brisbane. We will miss them. Such a beautiful part of the country. 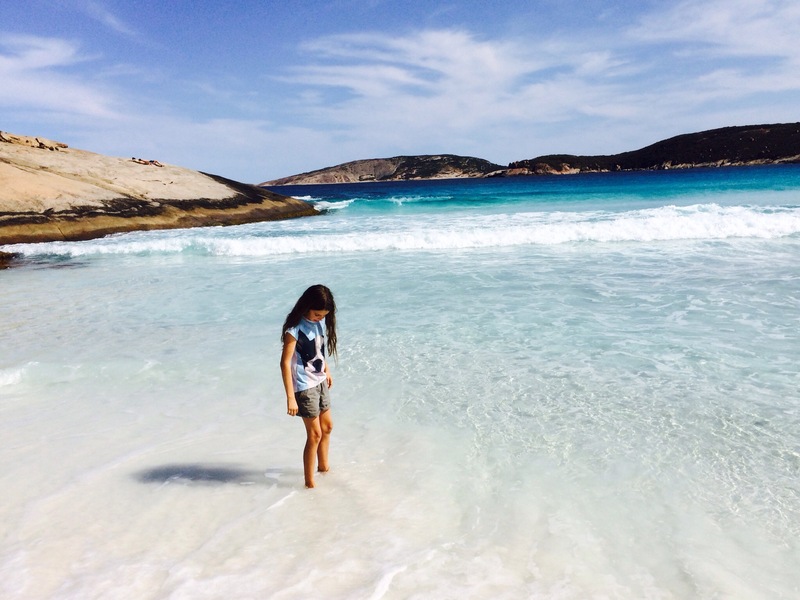 I loved Esperance . Looks like you all are still having a fantastic time but I am sure you are all looking forward to your own beds.. Yes such beautiful country down here. Would love to spend more time in all of the Southern coast of WA. It’s certainly going to feel nice to be in our own beds but have to say we’ve now entered the zone that this lifestyle is the new normal. You have certainly packed a lot into your Grand Adventure.. Kirsty your planning has seemingly paid off. 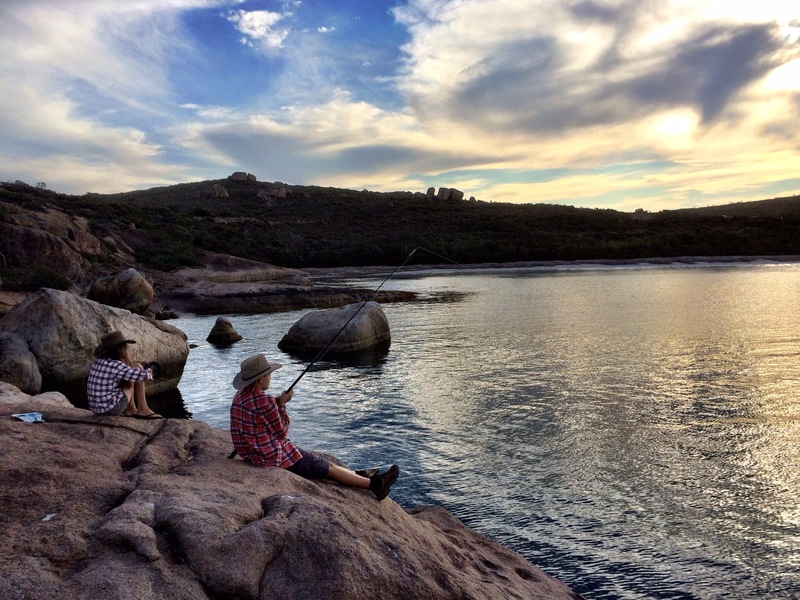 Great to see Noah and Amelia exploring a part of WA we have yet to see and enjoying every minute of it..Can,t really tell what fish it is Garn but there is an old saying ..” if it does not have scales. do not eat it”..I expect by now you are all heading east..Safe travelling .Lots of Love.. Yes they all had scales but still didn’t really know. We think that one was a type of wrasse, the other a type of Cod, and for other, the guide book says a Sargent Baker.